Supernovae such as 2014J, seen here from the Hubble Space Telescope, are among the most powerful events in the universe, revealing the structure of the universe as a bobbing cork reveals the contours of a lake’s surface. Astronomer Charles Telesco is primarily interested in the creation of planets and stars. So, when the University of Florida's giant telescope was pointed at a star undergoing a magnificent and explosive death, Telesco, a UF professor, didn't immediately appreciate what a rare and valuable find he had. He soon learned. The event was about to reveal insights into some of the universe's most tantalizing mysteries. A super-bright exploding star is known as a supernova, which can come from the death of a single very massive star or the ignition of a white dwarf – the remains of a low-mass star – as matter overflows onto it from a dying companion. Telesco and his international team, which included UF researchers Dan Li, Peter Barnes, Naibí Mariñas, and Han Zhang, recorded the latter, less-common type on CanariCam, a sophisticated infrared camera developed at UF. Attached to the largest optical-infrared telescope in the world, the Gran Telescopio Canarias in Spain's Canary Islands, CanariCam is one of the few astronomical instruments that can record wavelengths in the spectral region 8 to 25 micrometers, well beyond the range of human vision. UF is the nation's only institution with a stake in the GTC, which has been probing deep into the universe and producing new knowledge of exoplanets, planetary evolution, comets and galaxies for five years. Supernovae are among the most powerful events in the universe, revealing the structure of the universe as a bobbing cork reveals the contours of a lake's surface. They are also an essential piece of the puzzle of stellar evolution, but many of their properties remain a mystery. The observation of supernova 2014J is a first both for Telesco and CanariCam, and, as with many moments in scientific discovery, it wasn't planned. 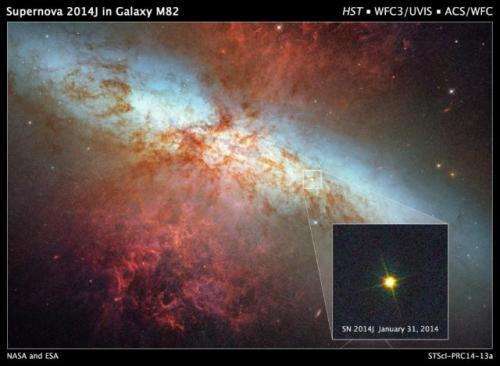 When Florida State University physicist David Collins visited UF in early 2014, he asked Telesco if he was observing the brand-new supernova that had exploded in the nearby galaxy M82. Telesco jumped at the suggestion and worked with observatory staff in Spain to make it happen. First, they took images of the supernova at two different wavelengths to see if they could detect it. "We weren't even sure we would be able to see it at these wavelengths," says Telesco. "We took pictures and got a weird ratio for the brightnesses of the supernova through the two filters. We thought we'd either screwed up or just made a very interesting finding." To settle the issue, Telesco's team took a detailed spectrum of the supernova and were blown away by what they saw. When a type Ia supernova explodes, carbon and oxygen burn hot and fast, undergoing a series of chain reactions that convert them to a rich soup of other elements, the most prominent being radioactive nickel, which decays into cobalt and finally iron. This nuclear furnace burns at a temperature of hundreds of billions of degrees for just a second as the explosion is ignited. Witnessing this moment and its aftermath gives astronomers a rolling, action-packed picture of unfolding events that scientists use to create accurate models of supernovae and their elusive origins. To the delight and surprise of Telesco and his colleagues, CanariCam recorded a pristine spectral signature of cobalt, a key element in the rapid and powerful alchemy of a supernova. The CanariCam team observed this elemental probe repeatedly between early and late spring, watching it change shape as the expanding supernova debris revealed more and more of its inner structure. That signature had been seen only once before, in a different, more distant supernova by a NASA space telescope in 2005, but it was only a one-time snapshot. Taking a "movie" of this evolution in 2014J was a big step forward. "It was like seeing cells divide for the first time," says Telesco. "Everyone knew that cell division occurred, but no one had actually seen it. Astrophysicists knew that cobalt would be produced, and they had ideas about how its appearance would change in the immediate aftermath of the explosion, but no one had actually seen it happen, which is critical to testing the models that the theorists come up with." The spectroscopy of the supernova was so valuable that Telesco and his team used precious telescope time to take a total of four spectra over a four-month period. "We got to watch it every month in a spectral region no one has ever monitored a type Ia supernova in before," says Telesco. "We were the only people capable of creating a temporal sequence of the closest type Ia supernova in 300 years." According to FSU astronomer Peter Höflich, a key collaborator on this project, these data will be the standard for the study of type Ia supernovae for at least a decade. To Telesco this is an example of a big payoff resulting from a colleague's offhand comment. "Sometimes it pays to listen," he says. The results of the CanariCam observations are published in the Dec. 20 issue of Astrophysical Journal. Telesco and Canaricam has found the best of space activites as with that of "Super Nova". This will be a milestone in Telesco's reaseach career.